Donnis Kainamoli on attack against Saint Pius during the basketball competition at the Raiwaqa court on April 7,2018.Photo:Simione Haravanua. Spowart are the new women winners of the Raiwaqa Inter-lane Basketball Easter competition at Ed’s Court, yesterday. The side were laced with national reps Benji Colata and Malakai Banuve who led Spowart’s campaign into winning the tournament. Spowart thrashed Crossroads by 47-35 in the final. 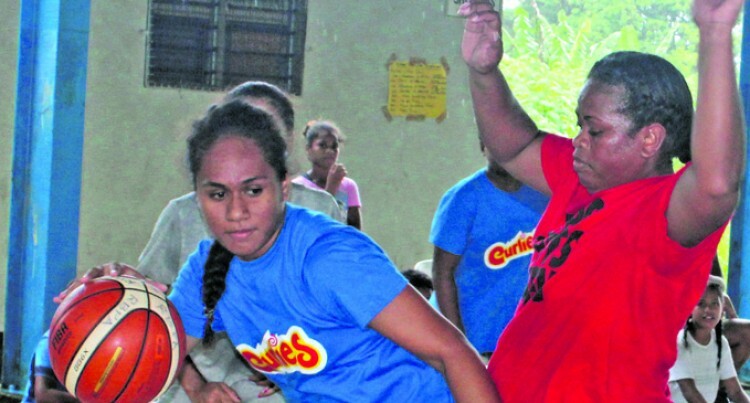 Raiwaqa Basketball committee member and former national rep Peniyasi Kainamoli said this was a build-up from the Easter weekend and it has been a success. “The tournament has seen families and communities coming together and enjoying the sport. Results: Womens final: Spowart 43- 35 Crossroads; Men’s final: Crossroads 47-27 Davui. Women’s semifinal: Crossroads 38- 21 St Pius, Davui 29- 25 Spowart; Men’s semifinal: Crossroads 37- 27 Bryce, Spowart 37-22 Grantham.